Don’t hate on this fancy plate. We took this picture after serving it up in our Sunday School class. Believe it or not, they didn’t have any fine china in the cabinets for us to use for the picture. It’s only 2 days to Halloween! Are you ready? 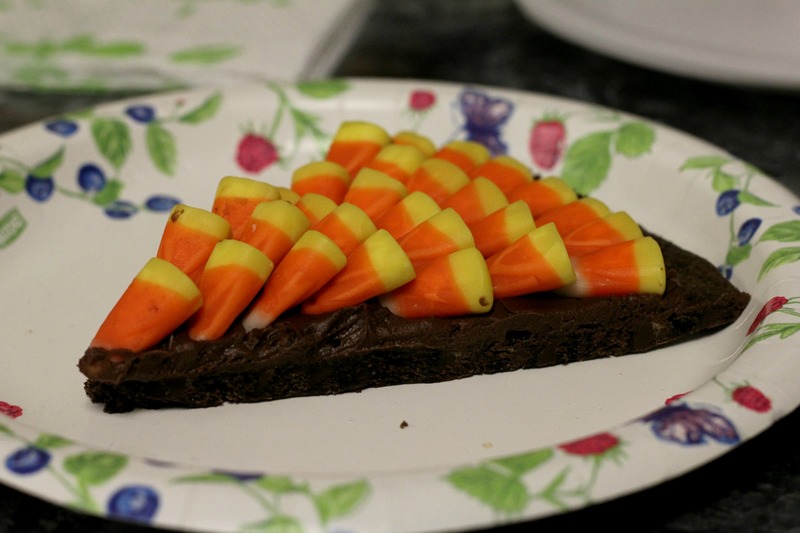 It seems like Halloween, more than any other holiday, is about throwing really cool parties with decorations and food items that people will talk about all the way into Thanksgiving. From punch with floating eyeballs, to hot dogs made to look like mummies, to cakes in the shape of spiders, Halloween and crazy food decorating go hand in hand. And nothing says it’s Halloween season like candy corn. Those colorful, sugary little cones mean one thing…Halloween is here again. 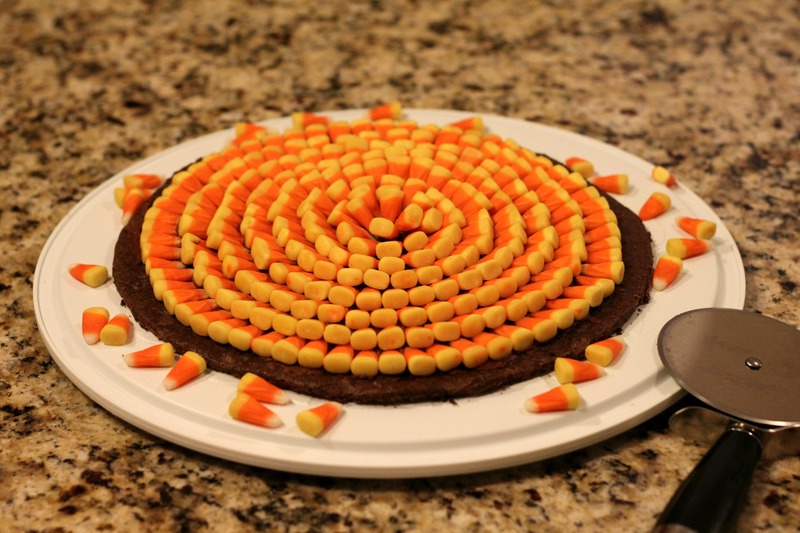 My favorite thing about this dessert is how geometric and pretty it is. 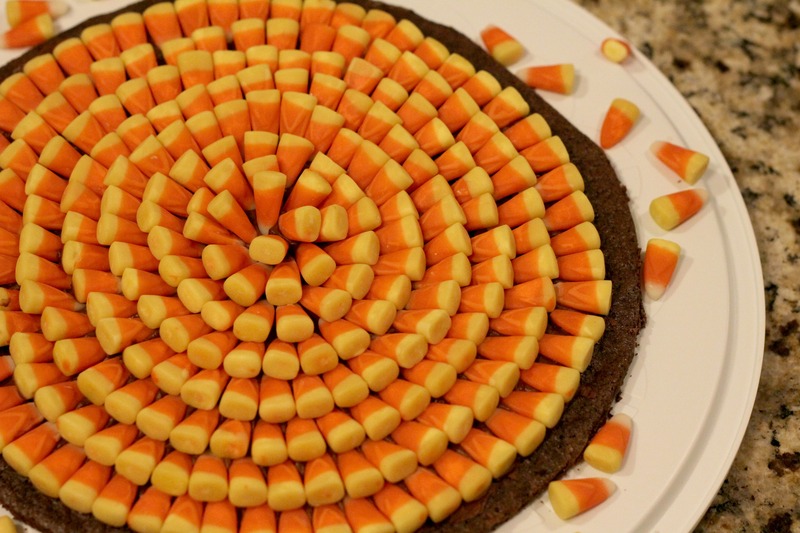 It definitely looks like a painstaking process, putting all those lil candy corns in perfect alignment. But I gotta tell ya, it only took my husband and me about 3 minutes to decorate. That’s it. Don’t you just love things that look harder than they really are? If you answered yes to that question, then you should make this for your next Halloween party. It’s ssssoooo easy. You should know that this dessert is only for those who have a great big sweet tooth and don’t mind sugar-overload. This stuff is super rich! In medium mixing bowl, stir together brownie mix, eggs, oil (or applesauce) and water until smooth. Stir in peanuts, if using. Spread on a 13-inch pizza pan coated with cooking spray. Bake at 350 degrees for 18 to 20 minutes or until wooden pick inserted in the center comes out almost clean. Cool on pan. Spread frosting over cookie to within 1 inch of edge. 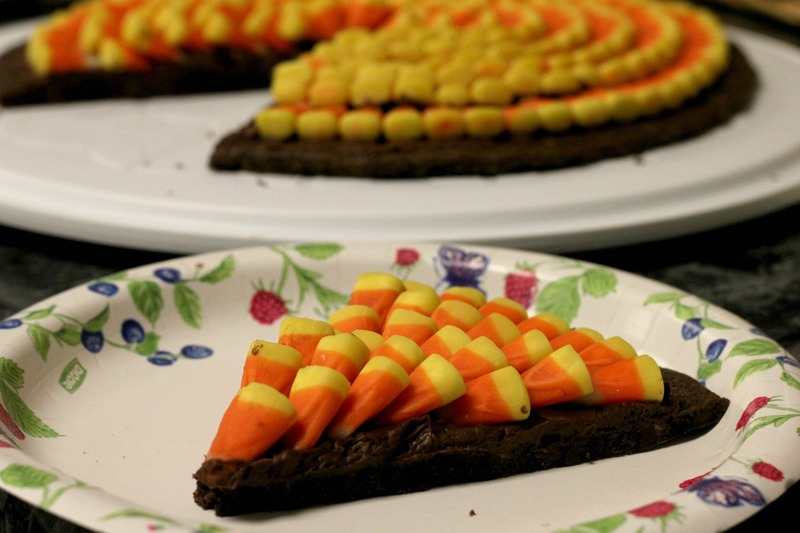 Decorate with candy corn. This is SO beautiful! I love your presentation even if on paper plates! Did it end up being too sweet with all those candy corns? I used to eat candy corns by the handfuls when I was a kid but it’s too sweet for me now. Candy corn delicious! Looks so good and creative!